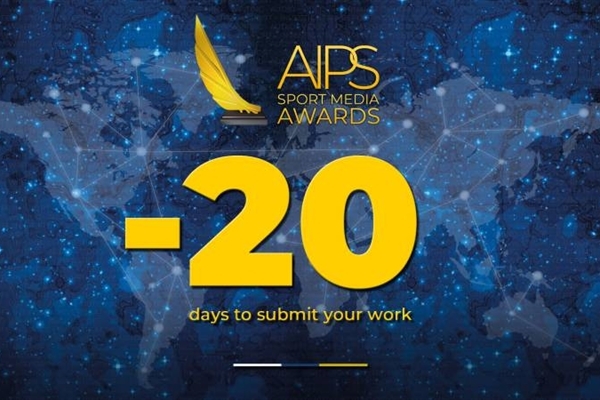 There are still 20 days to submit your work and participate in the upcoming AIPS Sport Media Awards. The countdown clock in our website has reached the -20 mark. Twenty days to submit your work. Twenty days to participate in the biggest prize for sport journalists, the AIPS Sport Media Awards. And here’s an explanation of the Awards in twenty numbers. There are six main fields of work, guaranteeing that everyone in the sport media industry will be able to participate: Photography, Writing, Audio, Video, Weblogs and Special Awards. Some of these categories have subcategories: Action Picture; Portfolio (Photography), Best Column; Best Colour Piece (Writing), Athlete profile; Documentary (Video) and A Life in Sport; Investigative Reporting (Special Awards, not open to submissions). Since the submission process started, on April 20th, we have received visits from 145 countries, a clear indication of the unique, truly global character of the AIPS Sport Media Awards. The total number of prizes that the AIPS Sport Media Awards offer, as follows: US$ 8,000 for the 8 winners of each category/subcategory. US$ 3,000 for each of the second-placed and US$ 2,000 for the third-placed. The AIPS Sport Media Awards final event will take place in Lausanne, in January 2019. All finalists will be invited by the organisation (including airplane ticket, accommodation, expenses, visa arrangements). In order to claim their prize, all finalists will have to be present in the event. The dedicated website www.aipsawards.com is available in six languages: English, Spanish, Italian, French, Arabic and Russian. But there are no language barriers to submit your work: everyone is free to submit in his/her preferred language, and if the submission reaches the final stages, it will be translated into English by a professional service. Founded in 1924, AIPS is the internationally-recognised body for sport journalism and its network currently bears 160 country-members from the five continents, with over 9,000 members across the world. The finalists and winners will be selected by a respected jury conformed by 10 members drawn from leading sport media organisations and backgrounds ranging across the Awards categories, plus the president of the jury, and AIPS president, Gianni Merlo. Each professional (whether directly employed or freelance) can submit up to two works in the same category or in different categories. As a true celebration of our profession, submissions are completely free! All participants must have been 18 years of age or older since July 1, 2017. Each of the submitted submissions has a 50 mb limit. If your video is heavier, you can submit a preview and a link with the full video. The portfolio category for photographers requires a minimum of three pictures and a maximum of five. They can be from the same event or from different events. As it is stated in the rules, only cropping is allowed. The AIPS Sport Media Awards were promoted in 5 global sporting events: Winter Olympics in PyeongChang, FIFA World Cup in Russia, the Asian Games in Indonesia, the Davis Cup, the UEFA Europa League and UEFA Champions League final, the Odesur games in Cochabamba, the European Swimming Championships in Glasgow and the European Athletics Championships in Berlin. Trying to understand the current and future challenges of our profession, we’ve been sharing talks and interviews with respected journalists from different countries. Nineteen journalists already talked to us and more are coming, part of the “Deconstructing the profession” package. All submissions must have been published/broadcast between July 1, 2017, and September 17, 2018, totalising a 444-day window. You can follow us on Twitter, Facebook and Instagram: @aipsawards The #SportMediaExcellence hashtag hopes to provide inspiration and tips for the younger generations of journalists. We don’t want to celebrate the best of sport journalism once a year, but on a daily basis. Check YouTube to watch our special videos: the promotional video unveiled in the AIPS Congress in Brussels and the “Everything you need to know” video with an awesome explanation from Chibuogwu Nnadiegbulam. Submissions can only be made in the Awards’ website, www.aipsawards.com. All submissions must be placed before September 17, 2017, 6pm CET.